I was sitting down to write this post when Dan called to ask me a question. And by “sitting down to write this post” I mean checking to see how many pageviews my last post had acquired while shoving some homemade granola in my mouth, burnt raisins and all. (Note, if you make your own granola, add the raisins at the end. Otherwise they burn and bloat, which is just as gross as it sounds). Anyway, when Dan called, perhaps it was obvious from my tone that I was busy shoving food in my face in the middle of something important because he asked, “Are you blogging?” and I said yes, which means I am now committed to a blog post. PS, please take this opportunity to note that my husband is awesome because even though he doesn’t always respond within milliseconds when I get up in his face, and I mean two inches from his face, whether he is working, eating, reading, or all three, and go, I blogged. Why don’t you look at my blog now? Seriously, how long are you going to wait to read it? he still encourages me to write all the time. Also he has a penchant for extreme bed-making, which adds to his awesomeness. And while we’re on the topic of Dan, he’s really into reading. Mostly he likes fantasy, science fiction, and non-fiction topics including, but not limited to economics, software, permaculture/ sustainable agriculture, gardening, the environment, business, and politics. I on the other hand, read fiction, memoirs (with special affection for stories about disability, immigration, addiction, or athletics), and non-fiction as long as it falls under the heading of true crime (specifically anything by Ann Rule). Our book choices rarely intersect. Over the past few years, he got me to read Spousenomics and Animal, Vegetable, Miracle, which were both very good. I’ve gotten him to read certain chapters of Healthy Sleep Habits, Happy Child and How to Cook Everything. Note the latter was far more user-friendly and effective than the former. 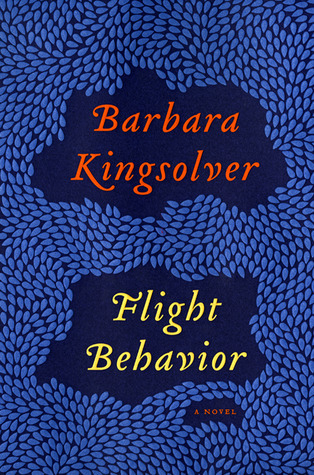 Imagine my delight when our book club chose Barbara Kingsolver’s “Flight Behavior” as our most recent selection. Dan and I would finally read the same book! Delight soon became disappointment however. Ms. Kingsolver’s latest novel wasn’t nearly as good as her previous work. I started it on our trip to Hawaii and didn’t finish it until we were on the way to our book club dinner. It took me an entire month to get through it. The main character was extremely likeable but Kingsolver felt the need to bang the reader over the head with metaphors about climate change, our dependence on oil, and consumerism. I understand that perhaps she meant to draw attention to these issues for the reader who had never before considered them. However I have to wonder, if you don’t believe that climate change is ruining our environment and/or you are apathetic about this topic, would you pick up this book in the first place? I give Flight Behavior a C+. Barabara Kingsolver herself, on the other hand, I totally have an author crush on. I got to see her speak at Duke University when they hosted Festival of the Book in 2006 and she was funny, humble, and interesting, just as you would expect. She admitted that she did not consider herself a writer, even she wrote her first novel, staying up late at night in closet where she worked on it following a full day at her regular job as a scientist. Once I finished that, I started Karen Thompson Walker’s “The Age of Miracles” which was 100% brilliant. This book chronicles the struggles of our beloved protagonist, Julia, as she navigates the social dynamics of sixth grade, the changing landscape of her family relationships, and the fact that the days on earth are gradually growing longer and longer. Normally I would shy away from anything labelled “dystopian” as it sounds dangerously close to science fiction, but maybe I need to re-think that, considering I couldn’t put this one down. (Same with The Hunger Games). I finished this one in just a week. It was one of those books that I would think about even when I wasn’t reading it. The author took me right back to sixth grade- all of Julia’s accounts of how it felt to be a late bloomer, what it was like to stare at the back of her crush’s head in math class, how it felt when her best friend ditched her- Walker NAILED IT. But she also took me to a place where everyone was storing their supplies and munitions, readying themselves for the apocalypse. Maybe we’re not too far away from that right now, actually, but I think that was also the whole point. I give this book an A+. Go read this book and if you don’t give it at least an A- we probably can’t hang out anymore. And if you like it, can we have coffee sometime? I am desperate to talk to someone about this book. I will read it – I need something new!!! !- and we WILL discuss it over a run. P.S. I thought Animal, Veg, Miracle was a bit…preachy. Sorry. I also have a huge author crush on her and have read and re-read many of her novels. Prodigal Summer and Poisonwood, namely. (Now I kind of want to revisit Animal Dreams and the other early works, but I digress.) We seem to have similar tastes in, well, everything, so now I’m convinced we’re related somehow, or maybe it’s just that you put into words so well the things I, too, am feeling/experiencing. Anyway, great blog post. And tell Dan I got picked for a 6 person jury that day and we found the suspected DUI driver not guilty! Such a cool experience!